As we both predicted in 2007, and reported on in 2012, the decadal trend line effectively bottomed dramatically in 2012. The progressive ice loss was simply that serious by 2007, although it had been unrecognized and ignored.. The remaining question was whether this local trend would be sustained beyond 2012 as the decadal effect would then diminish. It turns out that it did not and we are now into a net ice gain trend. 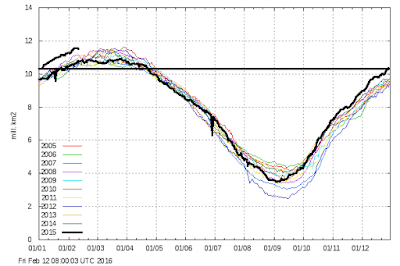 This can be expected to accfelerate although sea access should remain good until 2020 after which a serious cold snap should load the Arctic with ample new ice making a reversal a long way in the future. This also suggests that Antarctic ice extent has now peaked and will slowly begin to retreat. Yes, i seriously think that this long cycle we are experiencing is linked through the Main Atlantic current system to a cycle in the Southern circumpolar current all of which provides essentially minor climate variations we can live with and foolishly get excited about..
Total sea ice extent on the northern hemisphere since 2005. The ice extent values are calculated from the ice type data from the Ocean and Sea Ice, Satellite Application Facility (OSISAF), where areas with ice concentration higher than 30% are classified as ice. The total area of sea ice is the sum of First Year Ice (FYI), Multi Year Ice (MYI) and the area of ambiguous ice types, from the OSISAF ice type product. However, the total estimated ice area is underestimated due to unclassified coastal regions where mixed land/sea pixels confuse the applied ice type algorithm. The shown sea ice extent values are therefore recommended be used qualitatively in relation to ice extent values from other years shown in the figure. In late 2012 sea ice climatology and anomaly data will be available here. Please notice, that the sea ice extent in this plot is calculated with the coastal zones masked out. To see the absolute extent, go to this page.